Tuna melts have always been a big hit for me. Their filling, easy, everyone loves them, and most of all their melty. Yes, melty is a word. Somewhere. 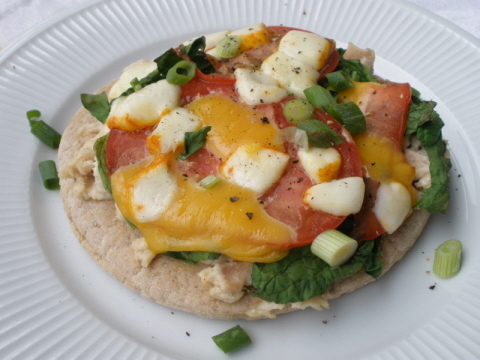 I used whole wheat pitas that were prepared locally and happen to be incredibly soft and delicious. You can always make your own if you are so inclined check out this search for some tasty options. For the tuna salad I used 2 fresh tuna fillets that I cooked, flaked, then I mixed in a bit of mayo, dill and lemon juice. But, make it however you like it. Preheat oven to 375° (use a toaster oven if you have one to save electricity). On baking sheet place both pitas and divide all ingredients evenly between the two, except for the green onion. Cook until cheese has melted, about 7 minutes. Remove and garnish with green onion. Don’t have your fill of pizza ideas? Get all 24 weeks worth here.